Whew, this has been one crazy week! So many things to discuss… It’s either complete months of silence or one week of grinding news (and there’s still more to come). Of course, the most noteworthy event was the first gameplay video from Asylum. This was raw, unadulterated in-game footage with the exception of a few crossfades. If I have to be honest, I was very nervous about this video; I had a hard time capturing the footage, squeezing an annoying 50fps out of my CPU (and yes, those 10 frames short of the golden 60 make a huge difference). On top of that, the entire footage amounted to 8 gigs so it wasn’t precisely lightweight. Converting those to a more reasonable size was another world of pain. But my real qualm was the actual video. After watching it a few dozen times, I realized it was lacking. There are tons of things that could have been improved but fans were threatening our lives for some new material, so I said to myself what the heck and pulled the plug. One hour later I was literally floored by the positive reactions: retweets, likes, pluses, mails, forum posts… 99% of people have been equally delighted and scared by this video. Since several hundred folks can’t be lying together at the same time, I guess it was fine after all. And we have many features that didn’t make it and will enhance the atmosphere even more… For example, falling dust. I couldn’t get this to work on Windows in time and it’s a shame because this small addition is very effective. It gives the game a considerably stronger 3D feel. Also, those of you who loved the animated skies in Scratches are in for a treat as we’re working on some groovy and scarifying nighttime scenes. Speaking of 3D, many people was expectedly disappointed to learn that Asylum is node-based (even though I have repeatedly stated this was the case). Yes, I know that fully 3D is nice and modern but there are several reasons why this wasn’t going to work in Asylum. In truth, there’s only one major reason: it doesn’t need to be in 3D. This isn’t a FPS where the environments are secondary to the gameplay. Those games don’t require players to explore every nook and cranny of a location, or carefully look for hints, for example, on a desk. Therefore, they can get away with repetitive scenes, reused props, and stuff. Players don’t spend so much time on these scenes; they either kill or run and move on. Things are extremely different in a game like Asylum. Each single room matters and even the bathrooms are brimming with details. Of course we repeat some things, if not we wouldn’t ever finish the game, but the level of detail required is several notches above full 3D games. This is why the exploration part in Asylum will be so lifelike and intriguing. 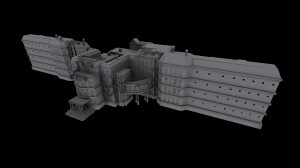 Going realtime 3D is simply out of our league because of budget and time constraints, but even if we had the resources, Asylum doesn’t need it. Let me also state that the walking in the video was intentionally slow and that you can move much faster in the actual game. There’s also plenty of freedom in choosing your direction; everything is highly non-linear. Finally, as someone stated in our YouTube channel, the discrete movement makes the game feel even scarier. And I definitely agree. One tiny little thing that also worried me from the video is the breathing effect that can be heard on the background. Not the one when the protagonist is startled but a constant breathing. Apparently this wasn’t very noticeable as nobody mentioned it. We’re still ironing out this detail; one of our goals is to make the central character always very present, and the effect fits. Add to this many thoughtful comments and you have a very fleshed out and intriguing character. That said, the breathing shouldn’t be annoying and I feared the gameplay video would give the wrong impression. This wasn’t the case fortunately, but I’d still love to hear your thoughts. This is already a lengthy post so I’ll save for the next update comments about the animations (did you catch the ocean through the window in the hallway?) and visuals. 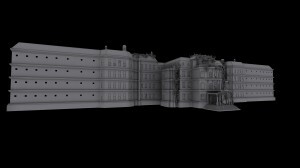 In the meantime, because you have been such a great audience, I leave you these renderings of the Asylum in all its raw glory. Yes — you get to explore it. Every nook and cranny of the place. This entry was posted on Thursday, August 11th, 2011 at 6:24 pm	and is filed under Games. You can follow any responses to this entry through the RSS 2.0 feed. Both comments and pings are currently closed. So there is just this feeling of being totally helpless and can´t fight back? Well, can you be killed? Yeah I noticed the breathing. I think it is subtle enough, but the sound is still a bit “rough” (like someone breathing in a spacesuite). But this may just be a false impression from the video. Exactly. Problem was the compression of the video, which made it sound more rough that it should have been. It will be softer in the game. To please (nearly) everyone, maybe make the breathing optional in the menus. There could be pleanty of people who do not want to hear the breathing the whole time. I think it is very atmospheric and should be turned on by default, but at least leave the option to the players, if they really cannot get along with it. I agree with the above poster that breathing should be on by default(the atmosphere of the game is doubled or tripled maybe,brilliant) but just thinking about playing the game at night,like i did with Scratches and Dark Fall 2,i think i should probably make reservations for a hospital room and prepare for a heart attack or sth. I watched the new videos on YouTube, Agustin, and was really excited to see the character interaction. (What a great character.) I kept freezing the screen to get a better look at him. Hanwell is already creepy enough, so when you mention nighttime scenes, I wonder if my nerves can stand it. BTW, you really have no reason to worry, the movement through the halls is very, very fluid and the artwork is completely amazing. The music and background sounds also add greatly. Three minutes into this game and we’re going to be exploring and worrying about the crazies. Nobody is going to be thinking about movement. Thank you so much for all your comments! As you know, I’ve been away for several days and a nice update is long overdue. I hope to catch up real soon. About the breathing: thing is, I’m not too kin about having many configurable options. My view is that everybody should experiment the same game as we intended, with the obvious exception of technical settings. We’ll decide after a few more experiments, and of course after seeing your reactions to the teaser. As always, stay tuned for a more juicy update! I actually think the breathing adds to the effect the game gives. After reading this and rewatching the trailer again with the breathing more on my mind, I found that it was done very well. In fact it could even, whether intentionally or unintentionally, become a kind of trademark within the Senscape game library. Look at Silent Hill and the “static sound effects.” I think that even more so than the intense fog that is always present; the static became the game’s calling card. I know there are those that will disagree with me, but again this all comes down to which is more stimulating for the individual; an audible or visual experience. Again I’m not saying this will definitely be the case and I’m also not saying that this is even near the goal here; in fact it may be the farthest thing from Agustin’s and the rest Senscape’s minds. Just something that crossed my mind. Damn I can’t wait for this game, 2012 will be the year of the 2 adventure monsters. Asylum by Agustin Cordes and The Witness by Jonathan Blow. Because I’m more into story and I love psychology and all that stuff I’m more interested in Asylum.